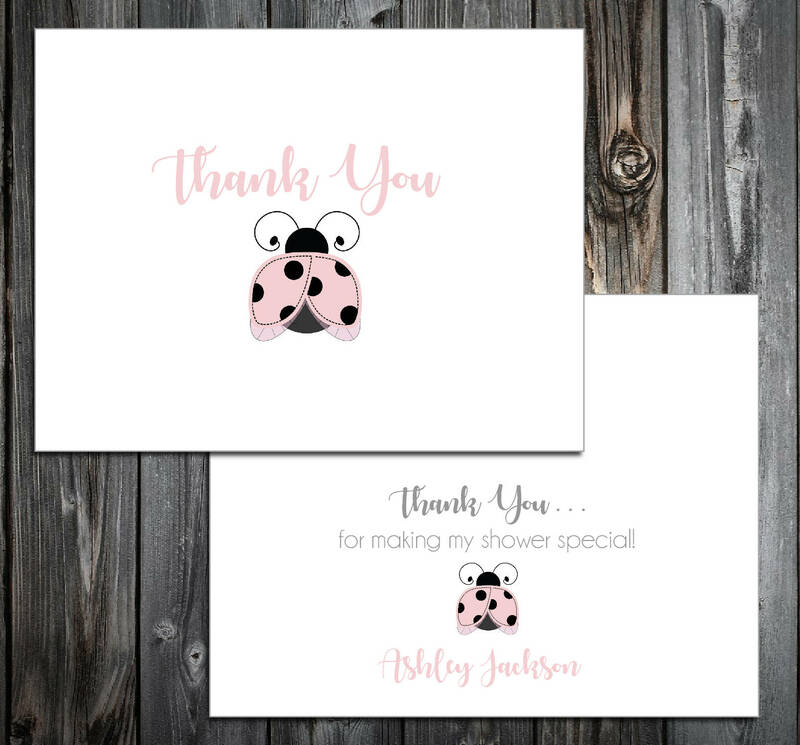 25 Pink Ladybug Baby Shower Thank You Notes. Price includes printing. When you receive your thank you's, they will be all ready to stuff into the envelopes. All you need to do fold the thank you and address and stamp your envelopes! Thank You Notes: Measures 5 1/2" x 4 1/4" when folded. Includes personalized watermark on the back. Inside can be blank or can be printed with your personalized wording. Printed on your choice of white or ivory textured stationery. Comes with envelopes and matching return address labels and envelope seals. Address labels and envelopes seals come in white only. Your wording on the inside and watermark on the back can be totally customized to what you want on these. Price includes black ink for main wording. Font color can be changed on these. How to submit your wording: You can either put your wording in the comment section of the payment or you can email it to me to my email address the is provided in your purchase confirmation. These thank you notes can have any wording you would like so please submit your wording with the wording you would like. Shipping: This item will be shipped priority mail and you will receive a tracking number when the item ships. Once your item ships please allow 2-5 days for delivery. Thank you notes get shipped flat for safe shipping. Need more or less than 25? Just message me and I can create a custom listing for the amount that you need. Only 35 cents each!